Newt easily adapts to our rapidly changing IP environments. This is the first product species that brings to life compact, quiet and robust UHD-over-IP ST 2110 to SDI conversion and ST 2110 to HDMI conversion. Newt is fluent in many open control protocols such as NMOS, EmBER+, and DashBoard (to name but a few), thus giving you the freedom to throw this little guy down into the IP environment of your choice. 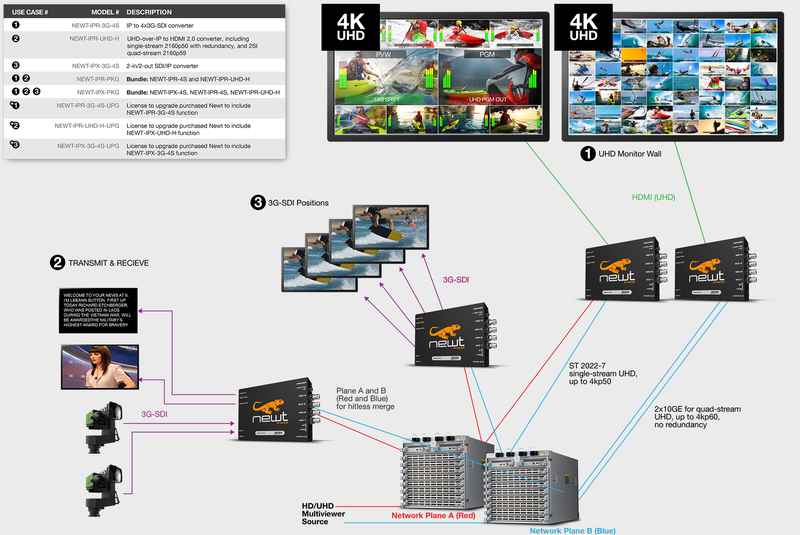 Compact & robust signal conversion and processing of many formats from HD to UHD. Open control gives you the freedom to run Newt from our DashBoard™ control system, and/or seamlessly from many 3rd-party control systems (e.g. VSM, Magellan, …) using industry standard protocols such as Ember+ and NMOS. Flexible mounting options enable Newt to scale any wall, zip-tie to a post, hide under a desk, behind a display, or for three of them to sit comfortably on an optional rack shelf. One-to-many mapping allows any IP flow to be assigned to one or many outputs, simplifying your operation. Newt supports multiple audio streams per output adapting easily to any audio stream and channel structure. Plus, an integrated audio router allows you to easily shuffle and assign audio channels where you need them. Ross Video’s SMPTE ST 2110 technology is JT-NM Tested, and amongst the most mature and widely deployed in the industry, both directly in Ross products and also through its OEM & Developer Solutions program. We are committed to ensuring that your investment in Ross products will interoperate with third parties. Newt is the strong silent type, with studio applications in mind. Unlike other IP conversion products with fans that scream loudly, you’ll barely hear a purr from Newt. Compact IP Gear that adapts to your environment. Suitably quiet for use in-studio, unlike other IP conversion products with fans that scream loudly. You’ll barely hear a purr from Newt. New V2.20 Firmware makes Newt even quieter! Newt’s flexible audio and video mapping lets Newt adapt to your network installation, so you don’t have to bend your network to fit. One-to-many mapping allows any IP flow to one or many outputs, simplifying your operation. Newt supports multiple audio streams per output adapting easily to any audio stream and channel structure. Support for 1-16 channels per stream, up to 16 streams per output. 1ms and 125ms packet time. Integrated audio router allows you to easily shuffle and assign audio channels where you need them. Compliant with wide senders and jittery networks. A place for online self-directed learning of the Ross Newt.